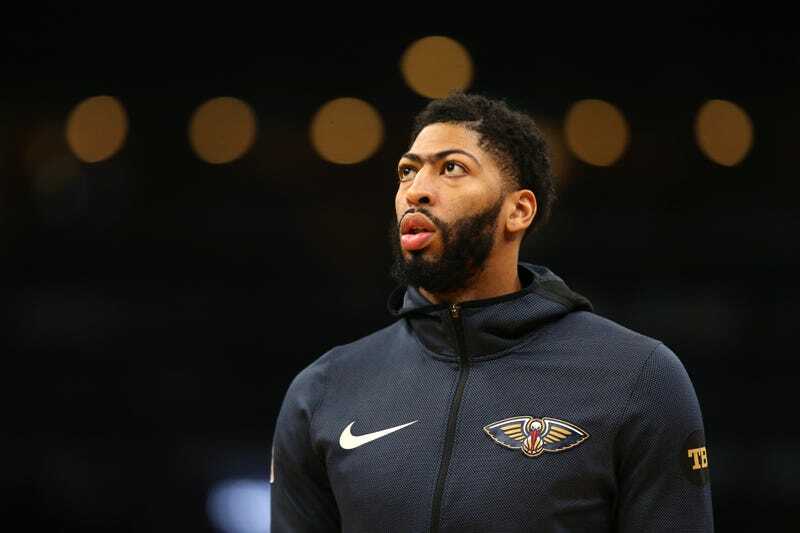 It sure was nice of Anthony Davis, who is not yet a member of the Los Angeles Lakers, to up his trade value on Friday night. The NBA’s only commodity worth talking about, apparently, threw up 48 points to go along with 17 rebounds, as the New Orleans Pelicans, his current team, beat the Dallas Mavericks 114-112. Davis, who has not been traded to the Boston Celtics just yet, feasted on the Mavs frontcourt of DeAndre Jordan and Maxi Kleber, doing most of his damage in the paint on both ends of the court. While everyone’s favorite rookie, Luka Dončić, kept his supernova first season going to the tune of 34 points on 62.5 percent shooting, it was Davis—still a member of the Pelicans, by the way—that decided the outcome of the game. With New Orleans down 1 with 44 seconds left, Davis hit a 14-foot jumper and was fouled by Jordan in the process, giving his team—which is not Los Angeles yet—its eventual winning margin. The Davis-Dončić showdown was a glimpse into the Western Conference’s future, one where only two teams have any good players and the rest of the league will be fighting for scraps in a Mad Max post-apocalyptic wasteland. Is it too early to start the Dončić-to-Golden State rumors? Lost in all the Davis trade talk—which is definitely something to focus on and certainly not a non-story that is being drummed up simply because LeBron James thought it might be fun to play with a once-in-a-generation talent—is the fact that he’s still really good at pretty much every aspect of the game. Friday’s game was a reminder that Davis isn’t just a trade chip or a conversation starter, but rather one of the best three or four players in the entire league. Hey, did you know that Anthony Davis might get traded?